The only definitive way to get the most from any engine modifications you have made (such as air intake systems, exhaust systems, camshafts, supercharger, turbo etc) is to have the electronic control unit (ECU) in your car professionally tuned/mapped on a dyno with a Hondata engine management system. 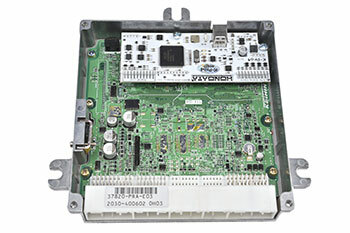 Hondata systems modify the standard Honda engine computers (ECUs), adding features and expanding the capabilities of the stock ECU. Vehicles with year of manufacture up to and including 2006 models require the ECU to be modified and in most cases hardware is added, for vehicles of years 2007 and onwards tuning takes place via an external programming interface. 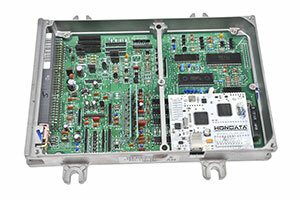 In all cases Hondata software is utilised in order to change the parameters/settings within the ECU (i.e. to tune the car). So why use Hondata instead of one of the many standalone systems available on the market? The answer is very simple; nothing will run a Honda engine better than a Honda ECU, and the Hondata systems all leave the Honda ECU completely intact thereby retaining full reliability, full dash functionality etc. Within the Flashpro Manager software a selection of base calibrations can be found, which are suitable as a starting point for tuning most applications. The FlashPro Manager software's advanced data-logging and live tuning capabilities combined with thoroughly tested base maps, allow the car to be tuned faster and more accurately than any other solution on the market. 2. The price of the Flashpro does not include dyno tuning, for a tuning price please email us with details of your setup.